Hillary Clinton’s book tour is a dose of much-needed therapy for her fans. 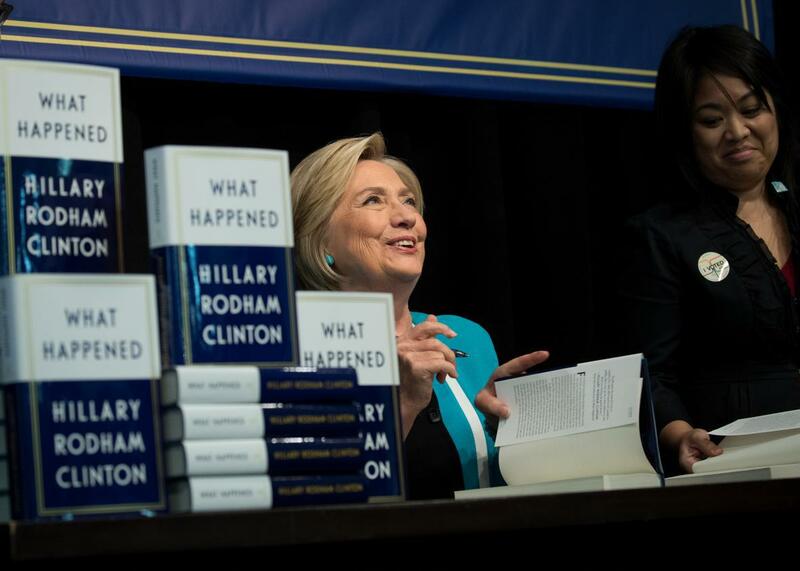 Hillary Clinton signs copies of her new book What Happened on September 12, 2017 in New York City. The product of her efforts seemed to have a similar effect on her audience. The bodies filling the seats at Washington, D.C.’s Warner Theatre quaked when Clinton walked onto the stage, giving her an ear-splitting standing ovation that shook the floor of the venue. Every minor attempt at a joke was met with riotous laughter, every dig at Trump with a lengthy round of applause. There were more than a few tears. You’ve got to be a pretty big Hillary Clinton fan to spend up to $82 to sit in a room and listen to her say things you’ve probably heard her say before. Because it’s D.C., the theater also contained several former campaign staffers. These weren’t casual Clinton voters. They were her diehards, the people for whom the termination of a potential Clinton presidency was nearly as devastating as the bombshell of a Trump one. Their enthusiastic support wasn’t just about making the first female president, but electing this specific candidate, with her formidable resume, unflagging composure, and history of pressing on in the face of sexist attacks. The election and American democracy as we once knew it may be over, but the cult of Hillary Clinton is not. Anyone who doubted Clinton’s “likability” or capacity to inspire hope in young women during her campaign should look to the crowds who’ll flock to her 15-city book tour to understand the magic some attributed to her candidacy. Monday’s event felt strangely intimate, with audience members eagerly nodding along as if they were at a cozy reunion with a friend they hadn’t seen in years. They erupted in cheers when Clinton spoke about turning to friends and family in the difficult days after the election. They booed and hissed when she mentioned Matt Lauer, whom Clinton calls out in the book for incessantly harping on her emails while letting Trump babble nonsense about ISIS. The audience seemed equally enthralled with Clinton the person as with Clinton the candidate, and genuinely concerned for her well-being. This book and attendant publicity tour will mark an important step in the grieving process for those Clinton fans who see themselves, and perhaps their own thwarted ambitions, in her struggles. For them, grappling with the daily horrors of the Trump administration has probably left little time or mental space to process Clinton’s loss. There is no shortage of policies to protest amid righteous, chanting hordes, but few outlets for feelings about the candidate herself. Seeing her onstage, back in the public eye on her own terms and in visibly good spirits, will give some a sense of closure they need. If Clinton can rebound and crank out a book after the worst setback of her professional life, maybe the rest of us can churn on, too. It was a rather endearing flub-up that Clinton never caught and Muscatine was too nice to correct. But, looking out on a sea of faces eager to process their lingering devastation in the company of hundreds of other Clinton fans, the former candidate might have committed a Freudian slip. As far as advice for recovering from electoral trauma goes, “lean on” isn’t half bad.